When I started writing this Untappd Catchup review their were just 6 badges and 6 beers to discuss... Somehow it blew out to 18 badges and 17 beers. In any case, I better finish it off before it gets any bigger! There's some great beers in this post so lease let me know your thoughts if you've had any of them. The latest Keller Door release from 4 Pines; Hoppy Doppelbock unlocked Wheel of Styles (Level 18). Despite the name, the beer wasn't particularly hoppy. However it was beautifully malty with plenty of dark fruit flavours, particularly raisins. Unfortunately the body is a little too thin for the style and it's lacking in flavour compared to previous Keller Door releases. I ventured back to 4 Pines that Friday and finally got around to sampling their Black Box series. In my mind they got progressively better throughout the logical order of the box. First up was the Schwarzbier, a type of German Dark Lager. Much like the Hoppy Doppelbock before it, I thought it was a bit light on flavour with minimal roast coming through - thankfully the beers that followed in this pack were more impressive, as this was decidedly average. The Untappd 6th Anniversary badge is why you're hearing about it. A beer that certainly couldn't be labelled with lacking flavour unlocked Trip to the Farm (Level 18). That beer was Boatrocker's superb Dark Saison. It was a wonderfully complex beer, with traditional saison yeast characteristics melding superbly with dark malts. To leave this review here would be to do it a great disservice. There is a nice spice component to the beer, with both pepper and cloves evident, although there are definitely others present as well, whilst there is also plenty of dark fruit flavours. This is a beer that I would highly recommend picking up if you come across it. I followed my own advice from a few weeks ago and sought our some more beers from Moor Beer Company of the U.K.. I tried their PMA (Positive Mental Attitude), a lovely example of an American Pale Ale brewed in support of a cancer charity. It's very nicely balanced, with bready malts complimenting the predominantly orange flavour coming from the hops. God Save the Queen (Level 36) is the reason you're reading about it. The Danish badges are coming thick and fast at the moment, with To Øl's Thirsty Frontier unlocking Danish Delight (Level 7). I'm slowly beginning to accept the term 'Session IPA' and it's beers like this that are driving that mindset change; you wouldn't know this wasn't a full strength IPA by tasting it! It's got good bitterness, plenty of citrus and tropical fruit flavours and a full bodied malt base although the malt flavour delivered is quite light - letting the hops shine through. Riding Steady is one of the new badges released last week. This badge is unlocked by drinking beers under 5% ABV, and one that I think you'll be seeing a lot of soon. The Lord Nelson Brewery Hotel's 2IC was the first beer to unlock this badge. This was an easy drinking English Brown Ale that clocked in at 4.8%. The was nice biscuity and toffee malt characteristics, complimented by a light nuttiness and some fruitiness. There was little to no hop bitterness. It was a very enjoyable cold weather beer. To coincide with Stone's 20th Anniversary - they've released the Stone Anniversary IPA Collection. They've re-brewed their 5th, 10th & 15th Anniversary beers and packaged them with the 20th; naturally I had to try them! The 10th Anniversary IPA unlocked 2X (Level 6). It was an excellent Imperial IPA, packed full of pine resin with pineapple and tropical fruit notes. I can see why this was a ground breaking beer 10 years ago! Another beer that Richo & Eliza picked up for me was the Buxton & Lervig collaborative effort; Trolltunga, a gooseberry sour IPA that unlocked Pucker Up (Level 43). I didn't pick up much in the way of hops, however there was plenty of a distinctly gooseberry flavour accompanied by nice tartness. This beer is named after a rock jutting over a lake in Norway, which I'm sure you've seen on your Facebook feeds before. The Iron Man badge has taken far longer to come around than I had expected it would. It's a badge for drinking beers with "Strong" in the style (ie. Belgian Strong Dark Ale etc.). A trip to Gold Class, of all places, finally unlocked this badge with one of the world's great beers; Chimay Blue. It's packed full of dark fruit flavours and spices. My words can't do justice to this beer in this short a post, please do yourself a favour and try this it's an absolute classic! I will endeavour to write a proper review in the not too distant future. Stone 15th Anniversary Imperial Black IPA was the first, and only, beer in this Untappd Catchup to unlock two badges; Sky's the Limit (Level 21) & Hopped Up (Level 49). As I've come to expect from Stone, it was an excellent beer! It was a roast dominant Black IPA, with coffee hanging around as well. The hops were certainly bitter, although definitely in the background, with pine and tropical fruit flavours the most prominent. We don't have many Märzen's brewed, or more accurately termed, in Australia - thus I was not that surprised that Stockade's Wanderer Märzen only unlocked Oktoberfest (Level 2). I sampled this lager whilst cooking mushroom risotto last Thursday. It was a really impressive lager, with slightly spicy, bready malts combining nicely with some light herbal/grassy hops. It was crisp and clean - exactly what I want in a lager. These guys are producing some pretty good stuff, I'd recommend trying their stuff if you come across it. A weekend away with the lads is always going to lead to a few refreshments being sunk. This time I made sure to include a few crafty offerings that I'd enjoy. Ballast Point's Grunion, incidentally one of their beers being stocked fresh at Dan Murphy's at the moment, was one of the beers that got the nod. This was a phenomenal beer; it was a wonderfully hoppy Pale Ale Witch's Brew (2016), the badge for drinking a beer over the Halloween weekend, is why you're reading about this beer now. Riding Steady (Level 2) rolled around less than a week after it was first unlocked. The beer was Mountain Goat's Summer Ale, around a campfire while we were camping up near Euroa. I couldn't think of a more perfect setting for drinking this beer, a favourite at Beer O'Clock Australia HQ. It's a perfect ale for the hot weather with masses of tropical fruit flavours on offer. The bitterness is restrained, but the dry finish keeps you coming back for more. It's very, very rare that I say this; but I actually drain poured the beer that unlocked the, relatively, new Raising the Heat badge. Raising the Heat can be unlocked by drinking beers classified as Spiced or Herbed beers (Gruits also count). The beer that ended up mostly down my sink was the Tecate brewed Cave Creek Chili Beer. What I will give it was some nice jalapeño-like spiciness, with the chili inside the beer the most enjoyable part of the drinking experience. Unfortunately. in addition to this nice spiciness, it was massively skunk - something that completely ruined the drinking experience. 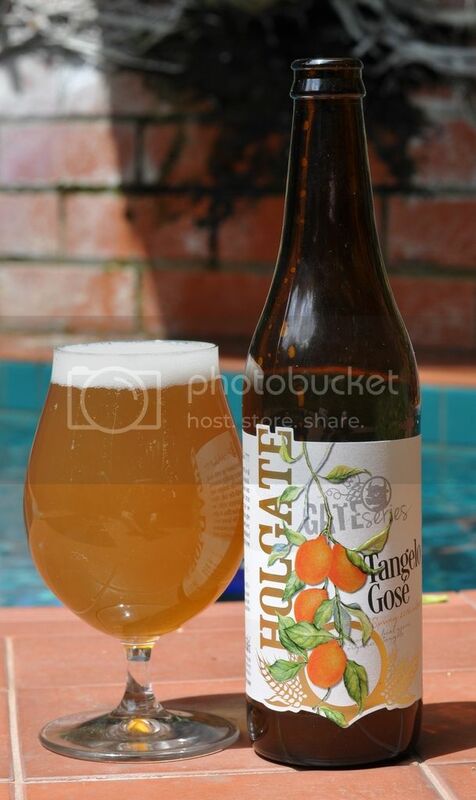 Around lunchtime on Cup Day the weather was still nice, Lizzie and I shared the new Holgate Tangelo Gose by the pool. Fittingly the badge was What Gose Round (Level 4). I really enjoyed this beer, with the mix of citrus (I'm guessing Tangelo) and light saltiness very refreshing. For those of you looking to get into Gose's, this wouldn't be a bad introductory beer to the style. For some reason a couple of years ago I decided that Cup Day was to be Saison day. La Sirere's Paradoxe was one of the Saisons to get a run out on Cup Day this year. This was a fantastic beer! It was a tart Saison, in line with what I believe historic Saisons to taste like - see my post on the history of Grisette/Saison here. Accompanying this tartness was some nice barnyard funk, with some rockmelon and wine barrel characteristics. Riding Steady (Level 3) was unlocked for the third time in barely a week. Last but not least was the Magalotti Doppio Malto Blonda, a Belgian Golden Ale that unlocked Fields of Gold (Level 7). It was a nice example of a Strong Belgian Blonde, with nice sweet malts and the booziness well hidden. It's got almost no hop bitterness, while the yeast plays a relatively low key role. There are better beers out there, but it's still an enjoyable Blonde.